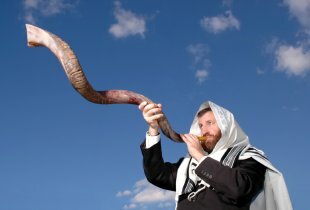 I was curious about what Rosh Hashanah is and I have done a little research about it. Is the jewish new year,is the new year for people, animals, and legal contracts. The name means “Head of the Year” is observed for two days beginning on 1 Tishrei, the first day of the Jewish year. It is the anniversary of the creation of Adam and Eve, the first man and woman, and their first actions toward the realization of mankind’s role in G‑d’s world. Rosh Hashanah occurs 163 days after the first day of Passover (Pesach). The Yamim Nora’im are preceded by the month of Elul, during which Jews are supposed to begin a self-examination and repentance, a process that culminates in the ten days of the Yamim Nora’im known as beginning with Rosh Hashanah and ending with the holiday of Yom Kippur. In this days the people used to eat special food like apples and honey, to symbolize a sweet new year. Other foods with a symbolic meaning may be served, such as the head of a fish (to symbolize the “head” of the year). I think is good to know more about other countries traditions and is important to make a comparison between these traditions and our own tradition.